Historischen Innenstadt auf dem Land mit 1 Schlafzimmer und Arbeitszimmer, Bad und Küche. Das 1892 erbaute, ein charmantes Cottage Denver hervorragend ausgestattet. Die zentrale Lage des Innenstadt 'Juwel' können Sie die Aufregung der Stadt zu genießen, während Rückzug in einer ruhigen Nachbarschaft. Dieses Haus wurde geschmackvoll aktualisiert und enthält eine 1 Schlafzimmer mit einem Doppelbett. Die Studie / Büro, das herausziehen Doppelschlaf enthält. Das Haus kann 3 schlafen. Komplett eingerichtete Haus mit übergroßen Speisesaal perfekt für Unterhaltung, Wohnzimmer und voll ausgestattete Küche mit einem Spaziergang in Speisekammer. All Bar, Küche, Geschirr / Besteck, die für Unterhaltung oder einen ruhigen Abend zu Hause sind enthalten. Große vordere überdachte Veranda mit Stühlen können Sie die Natur genießen mit ein in Hof mit Rasen eingezäunt. 6 Blocks von Downtown Denver, 2 Blocks von der Denver Light Rail Station (mit Kongresszentrum Zugang, Sportarena Zugang) 2 Blocks von Denvers Bike-Sharing-Programm (B-Zyklus, download B-Zyklus-App für weitere Informationen). Benötigen Sie den Zugriff auf Lebensmittel? Kein Problem, 2 Blocks zum Safeway, wo Sie für Ihre Bedürfnisse Lebensmittelgeschäft gehen können. Dies ist ein Nichtraucherhaus irgendeiner Art! I enjoyed the month I stayed here. The cottage has a terrific location within walking distance to all sorts of interesting places -- from downtown and Capitol Hill on one side to the Rino on the other. Lots of old homes in 5 Points and Curtis Park along with newer buildings -- an intriguing mix of architectural styles to stroll past. Cottage is very quiet, despite being centrally located. I rarely heard street noise. Equipped with a large kitchen, so if you like to cook (I do) it's well set up for that. If I could change one thing, I would add blackout drapes over the blinds in the bedroom; security lights keep it bright after dark. My one retirement plan was to get out of the Texas heat for the summer. Denver was my first stop, and while the weather didn't exactly cooperate, I got extremely lucky in finding Bill's 1892 cottage for the entire month of June. Even on the hottest days, 105 in Denver, who would have thought that, the thick walls, with just a little assistance from the a/c that is there, made sure it stayed nice and cool. And of course even on the hottest days, early morning coffee on the porch or wine at night were just perfect. The cottage was ideal for me, including a very nice office space overlooking the front yard, which Bill keeps immaculately gardened. Since I am still kicking the working habit, it was great to sit there and have such a lovely view. Although I really didn't take advantage of it, if I had been willing to make the effort to cook, the kitchen is very well stocked. There was hardly anything that I could have needed that was not there. As it was, using the coffee pot and the toaster were more than enough to keep me happy. Partially that's because the cottage is located in such a great location, so that there are plenty of eating places available within a short distance. The closest cluster is around Welton in the 5 Points area, where there is also a stop for the light rail to downtown and the airport. My favorites were The Rolling Pin bakery, Rosenberg's deli for bagels, Bird Call for great chicken sandwiches, and Coffee at the Point. Just a tad further over is the whole Larimer street collection of restaurants. A shout out to Billy's Gourmet Hot Dogs, as one of those places I just kept returning to. And if you are a cook, the Safeway is less than a 10 minute walk. You are also less than 1 mile, and a pretty walk/jog to City Park, or in the other direction to Coors field where I finally caught a Rockies game just before leaving. Throw in nice touches like a Bang & Olufsen system, complete cable and good internet service, and I could not have had a better place to stay for the month of June. Bill was the perfect host, available if needed, but not intrusive, and knowing that he lives next door, provided comfort that any need would be addressed quickly. Now if he could just control the weather a bit better! Bill is very nice, lives close by and is very helpful, in case one needs anything. I had an excellent stay! Why stay any place else? This is the best! This is a perfect place to stay - walking distance to many places - so convenient. The little cottage is extremely roomy and very clean.Upon arrival, there is a welcome gift and a booklet that tells many places to eat and things to do.The Dunbar Tap and Kitchen, Rosenberg's Bagels, Pastry shop, Coffee Shop all within a short walk. We enjoyed downtown many times, visited the Art Museum, the Zoo, baseball games, played golf, ate at many great restaurants as well as Trucks (food) in the Park, and just relaxed in our little cottage.We had all the conveniences in this place as we would at home. Bill was always available. We tell all our friends who might go to Denver to stay there. Because it's so great, we stay there every year. We can't recommend this place highly enough. 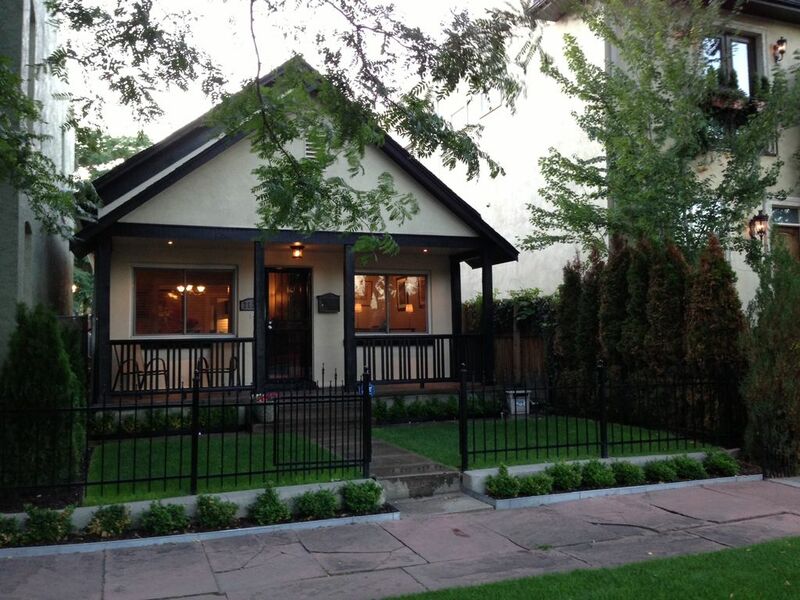 Staying at Bill's cottage house was a great opportunity for me and my wife to discover Denver and its history. Five Points district is quiet, very charming, green, with some visible historical tradition (old architecture). One of biggest Denver public parks is just 20 min walk, also the City Center is very close. The cottage house has everything what is needed to feel like at home (a big dining table was our favourite place to sit for slow food breakfasts) , the kitchen equipment is full range to cook and prepare everything you want. The host was very responsive and helped us with all (minor) problems on the way. We strongly recommend Bill's place to any traveler who would like to stay close to the pulse of City life but also have a quiet escape place. Old charm with very nice finishes and amenities. Bill is great person to work with! Diese Innenstadt von Denver Cottage liegt 5 Blocks von der Innenstadt entfernt. Viele Restaurants und Bars, aus zu Fuß zu erreichen wählen. Museen und Theater zu Fuß erreichbar. Stadtbahn-Zugang innerhalb von zwei Blöcken und Autobahnanschluss innerhalb von 2 Meilen. Coors Field und 16th Street Mall zu Fuß zu erreichen. Machen Sie einen Spaziergang (6 Blocks) an die historische Brown Palace Hotel für einen Cocktail an der Schiffs Tavern vor einer Nacht in Denver 16th Street Mall oder Larimer Square. In fußläufiger Entfernung zu der neu renovierten St. entfernt Josefs Hospital. In der Nähe der National Western Lizenz anzeigen Arena! Non refundable Cleaning fee of $125.00 is due upon arrival. Should renter decide to leave or vacate the premise prior to contract/ lease date, no monies shall be returned for the remaining days on the contract/ lease.